Goneighbor.org is a virtual platform, encouraging and facitilitating real world connections and communities. We believe that communities working together - are stronger, safer, and more productive. We strive to facilitate this safely and creatively - by ensuring that all neighbors are verified, and providing a platform for communication and sharing of interests and information. 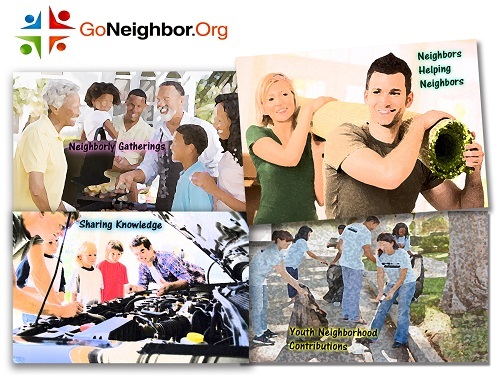 We are here to support you by assisting you in building your neighborhood community - we can even invite those in your neighborhood via a phone, leaving you the time to do what's important - engage with your community. Phone – You can reach Goneighbor.org via our neighborhood hotline or via email. GoNeighbor.Org uses an innovative GEO-IP system to identify a users location and identify neighbors in their area. Once a user has been verified they are granted access to the neighborhood network, where they can see the most recent news and events in their neighborhood, create groups or events and sell their items in the marketplace. A Verified Neighbor is someone who has verified their address. Only VERIFIED NEIGHBORS can view their neighborhood activities and respond to a post or check their inbox or invite other neighbors. An Un-Verified Neighbor is a neighbor who has only given their phone number and emailaddress but has not verified their address. Unverified neighbors are not given full access to the neighborhood dashboard. 1. Upload a valid State Issued ID or Utility Bill with your full address and name - You will be given the option to capture the photograph of your id/utility bill using your computer. 3. Request a GoNeighbor.Org Address verification PostCard with Invite Code - May take upto one week. All options except option number 3, gives instant approval and access to your GoNeighbor.Org neighborhood network. Address Verification -Neighbors need to verify their addresses before they can view and participate in their neighborhood network. Please refer to Upgrade to verified status for options to upgrade to Verfied Status. Please email support@goneighbor.org should you find any issues with security or if you find any un neighborhly behavior. There is also an abuse reporting mechanism on the dashboard that Neighbors can use to eject any neighbors when there is any misconduct. We are here to help you build your neighborhood network - and two ways in which we can help:. Call into the GoNeighbor.Org telephone portal and press 6 - You will be directed to pay $5 to send out an automated voice mails to upto 50 of your neighbors. A Trust Coin is a Neighborly Coin that is earned by a verified Neighbor when they participate in community building. A Hyper Local Neighborhood Network that provides a platform for Neighbors to Connect and Build stronger Communities. United States = Historical Neighborhood boundaries.